Just Romantic Suspense: Actions can earn a person the title of 'hero'. Actions can earn a person the title of 'hero'. Congratulations to "Natalija", the winner in Dawn's giveaway. Thank you to all who participated! Lots of actions can earn a person the title of "hero." In my novel, Burn, one heroic Firefighter Ryan Monroe action Ryan performs—aside from running into a burning building to save the love of his life, Chloe Addison—is adopting his Dalmatian sidekick Max from the city animal shelter. Every day, so many animals wait in shelters for the right family to come along and love them. A common misconception is that shelter dogs are all poorly bred mutts that will be hard to house-train and difficult to assimilate into family life. Not true! As a rescue transport driver and shelter volunteer, I can tell you some of the sweetest, most intelligent dogs often find themselves homeless for a variety of reasons, often a change in family circumstances and NOT because they simply couldn't be house-trained. Pure-bred dogs, too. I've seen German shepherds, golden retrievers, more chihuahuas than I can count, and even Great Pyrenees surrendered when a family needs to move to a new home that doesn't allow pets. These are dogs for which breeders would charge hundreds, if not thousands, of dollars. And you can adopt them for no more than the cost of their health checkup at your local shelter. When you're ready to bring a new furry companion into your life, head to your local animal shelter, or search online for breed-specific rescue groups if there is a certain breed you love. Be a hero like Ryan, no burning building required. She hopped down from her seat, and he walked backward, leading her to an area near the dartboard—clear of tables, though not quite a “dance floor.” He pulled her into a loose embrace, and her skin warmed at the firm hand curling over the small of her back, at the calloused fingers gently gripping her freshly manicured ones in the other. “I do what I can.” He stepped back and twirled her underneath his arm before pulling her into him. She laughed as her palm met the hard plane of his chest, and she quickly swept it to the side until it landed on his bicep. As if that was any less distracting. The guy was a solid wall of muscle. “Is it working?” he asked. Congratulations on your first release! Yum, loved the excerpt. Added to my ever growing wish list. All our pets have been rescued or just stray dogs who wandered into their forever home. They do make the best friends. Both of our cats are from the shelter. Most of our pets over the years have been rescues... wish I could take home more! I know what you mean! I need to buy a farm! Hi, Dawn! 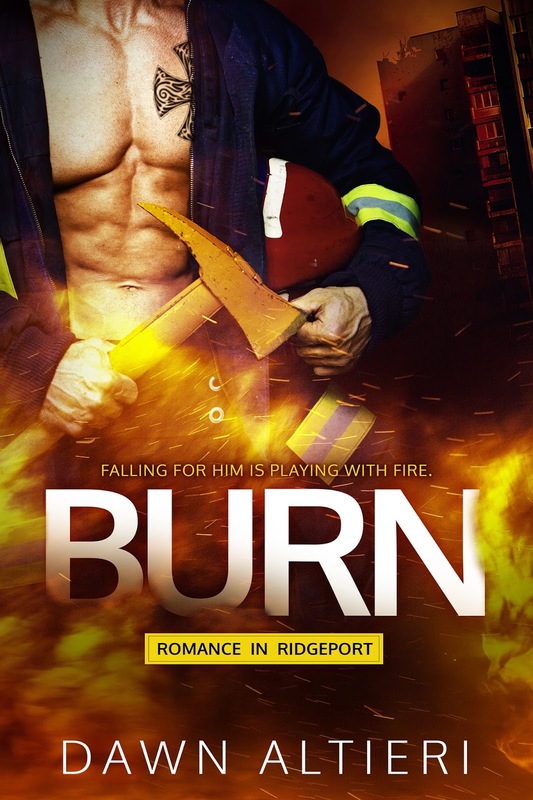 Congratulations on the release of BURN! Thank you so much Mary! I hope you enjoy it! Thanks bn100! I hope you enjoy it! Hi Dawn, BURN sounds like my kind of read. Awesome! I hope you enjoy it Mary! Woof, that's a yummy cover. Thanks for sharing excerpt from the books. And congrats with your book release, Dawn! I agree about the yummy cover, Dee! Thank you so much!